Jane Winstone was born in Whanganui and at age 16, while still a pupil at Sacred Heart Convent, she took up flying as a hobby, travelling to New Plymouth and Hawera for lessons, until an aero club opened in Whanganui. 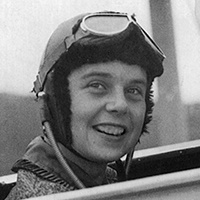 She flew solo at 17, becoming the country’s youngest female pilot at the time. Jane was keen to help the war effort and offered her services to the Air Transport Auxiliary (ATA) in Britain. A talented pilot and a courageous woman, Jane Winstone was one of 16 women from the ATA killed during the war, when the engine of her Spitfire failed after takeoff. She is buried in the Maidenhead Cemetery, Berkshire, England.